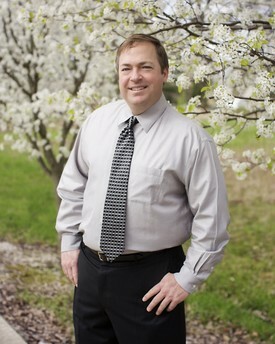 Dr. Scott Powers graduated from Indiana University School of Dentistry in 1998. He then completed a one year general practice residency at St. Anthony Hospital Oklahoma City, Oklahoma. After residency, Dr. Powers completed a one year fellowship in implant dentistry at Southern Illinois University, Edwardsville, Illinois. Less than 1% of all dentist have had 2 years of residency and fellowship training. Dr. Powers is also one of only a few general dentist in the state certified to administer I.V. sedation. He has taken hundreds of hours of continuing education and loves to stay up to date on the latest advancements especially in the field of implant dentistry. Dr. Powers' father and grandfather have been doctors in Lyons, IN since 1928. Dr. Powers has been the Town of Lyons Board President for the past 10 years. Dr. Scott Powers has been married for 15 years to his wife Dr. Linda Powers. She practices orthodontics in Lyons Indiana and is the only orthodontist in Greene County. They have 2 boys Luke and John who are ages 11 and 7. Dr. Powers is an instrument rated pilot with over 1000 hours logged and also enjoys hunting, fishing, camping, and traveling. Our office recognize that our patients are unique individuals who have placed a great deal of trust in us. That is just one reason why we value each and every patient relationship. Dr. Powers' unique training and experience places him in a position to provide individualized treatment options for even our most complex dental patients. We appreciate the time you’ve taken to visit this site and find out more about our dental practice and the many services we can provide to help you achieve optimum oral health.